When it comes to finding the perfect ceiling fans for your home or office, how do you even know where to start? How big does your fan need to be? What fan will provide you with the best functionality as well as beautiful design? What if you can’t find a style of finishing you actually like? Whatever concerns or questions you may have about finding ceiling fans for your space, our team at Franklin Lighting in Sarasota has you covered. Our experienced lighting consultants are constantly staying up-to-date on lighting trends, and we’re always aware of any changes occurring in the lighting industry to ensure we can provide our customers with the best quality selection of lighting products in the region. Ready to find ceiling fans that will fit your personal style and preferred budget? Contact us today to schedule an appointment with one of our qualified lighting experts. You can also visit our Sarasota showroom at your own leisure, which is the region’s largest ceiling fan showroom with more than 140 fans on display. We look forward to meeting you. Need help finding our showroom? Check out the map below. 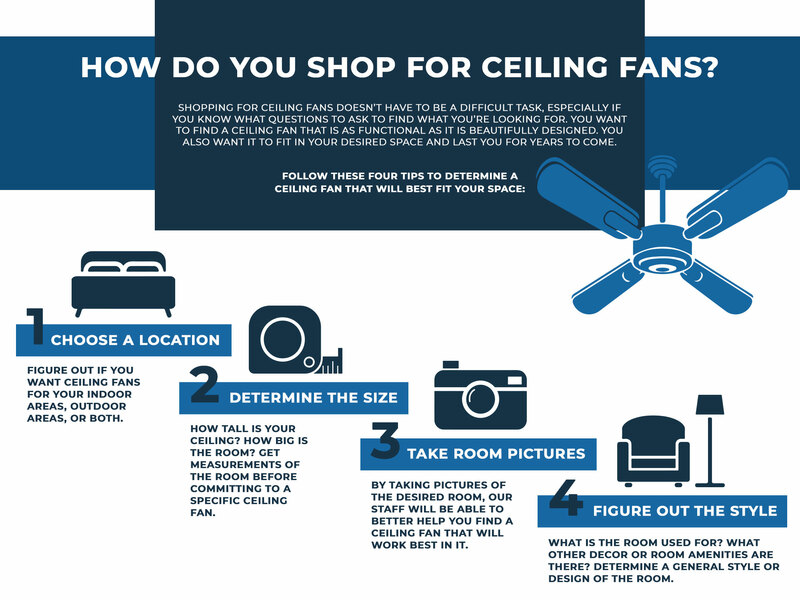 Shopping for ceiling fans doesn’t have to be as complicated as it might sound, especially if you come prepared and know what questions to ask to find exactly what you’re looking for. You want a ceiling fan for your home or office that will comfortably fit, serve its functional purpose and look gorgeous doing so. Adding a ceiling fan to a room can improve air flow and cool things off in the summer, and it can also serve as an intricate detail to the room that will impress any guests that walk through it. Figure out if you want ceiling fans for your indoor areas, outdoor areas, or both. At Franklin Lighting, we offer a ceiling fan selection that will accommodate for any of the areas inside or outside of your home where you want to install a ceiling fan. Our indoor ceiling fans range in size, design and finishing. Whether you’re seeking traditional or contemporary fans, huggers or large fans, or even portable and wall fans, our selection of indoor ceiling fans is an impressive one. Indoor fans are usually categorized as dry-rated or dry-location ceiling fans. Keep in mind that a ceiling fan you would install in your living room won’t work on your Sarasota front porch. Luckily, we offer outdoor ceiling fans that can be exposed to inclement weather conditions without affecting their performance or lifespans. We offer damp-location and wet-location ceiling fans. Damp-location fans are designed to withstand humidity and moisture, but they aren’t water-resistant to rain and ocean spray like wet-location fans are. How tall is your ceiling? How big is the room? We recommend getting measurements of the room before committing to a specific ceiling fan. You want to allow at least 8 inches between your ceiling and the fan’s blades, and at least 1.5 feet between any of your walls and the blades. If your ceiling fan will be nearby any light fixtures, give at least 3.5 feet of room between them as a safety measure. By taking pictures of the desired room or space where you’ll install a ceiling fan, our staff will be able to better help you find a ceiling fan that will work best in it. We have years of experience connecting homeowners with their ideal lighting and ceiling fan designs, and it’s always helpful to have a visual aid in order to best assist our customers. Take photos on your smartphone or with a digital camera, and bring those photos with you to our Sarasota lighting showroom. From there, we can narrow down your selection to the ceiling fans in our selection that are practical and will work best in your desired space. What is the room or space used for? What other decor or room amenities are there in the room? What’s the general ambiance you’re going for in the room? You want to determine your preferred style or design of a ceiling fan before shopping for one. This will make the entire process easier and will help you narrow down your selection. Ceiling fans might seem like they’re one in the same. Who cares what they look like as long as they keep the individuals in your home or office cool, right? Wrong. Sure, ceiling fans add function to the rooms in your home and can significantly lower your energy bill costs, but they also add style, design and provide you with an opportunity to add your own personal flair to a space. You can even make a ceiling fan the main focal point of a room — an advanced interior design element. Our fans range in style, from contemporary to Victorian, and they can feature multiple light sources as well. Below, we’ve listed the types of ceiling fans and ceiling fan accessories we offer at Franklin Lighting. SMALL FANS: Best for the smaller rooms and spaces in your home. MEDIUM FANS: Average-sized ceiling fans. LARGE FANS: Ceiling fans for your larger rooms and spaces. HUGGERS: Fans installed close to your ceiling for a sleek, small profile. DAMP-LOCATION FANS: Outdoor ceiling fans resistant to humidity and moisture. WET-LOCATION FANS: Outdoor ceiling fans that are water-resistant. PORTABLE AND WALL FANS: Fans that aren’t necessarily installed into your ceiling and can easily be moved around. FAN BLADES: Come in different sizes and styles. FAN CONTROLS: Make your life simpler with a control switch or remote control. FITTERS: The section of a ceiling fan that makes it possible to install lights within it. LIGHT KITS: Gives your ceiling fans the option of providing light, too. FAN ACCESSORIES: The intricate details that make your ceiling fans stand out. For any questions you may have about our ceiling fans and any additional ceiling fan accessories, visit our showroom today to speak to a Franklin Lighting consultant. Can’t make it in right away? You can also take a virtual tour of our lighting showroom here. Ceiling fans are a great design element to add to any of the rooms in your home; however, they serve a functional purpose beyond style and design. Though there are many benefits to installing ceiling fans throughout your Sarasota home, we’ve listed five main ones below. They can lower your energy bills. Instead of blasting your air conditioning unit all summer long, we suggest installing ceiling fans to the rooms in your home to reduce energy costs. Studies have shown ceiling fans can lower your energy bills by up to 30 to 40 percent, even though, technically, they don’t lower the temperature of your rooms — they simply generate air flow that makes your rooms feel cooler than they actually are. They’re a style-driven home accessory. Our ceiling fans at Franklin Lighting come in a variety of sizes, finishes, material types and styles. We offer this variety because we understand no two homeowners will have the same exact taste and style preference, and ceiling fans should definitely add a unique element design to the rooms in your home. They’re a versatile component for any room. Since ceiling fans can be installed in any room, indoors or outdoors, their versatility is a major benefit. They make any environment a more comfortable one, especially in the hot, summer months. Cool down your front porch or make your bedroom more comfortable to sleep in at night — a ceiling fan can help with these specific tasks and more. They can serve as an illumination option. If you need to provide circulation to a room as well as efficient lighting, a ceiling fan can knock out those two birds with one stone. Ceiling fans with light features can provide you with beautiful and functional illumination, whether you select a fan with a built-in light or install one yourself with a light kit. They’re a valuable aspect year-round. We all know ceiling fans can cool down a room, but did you know they can also be used to circulate warm air in the winter months, too? When you reverse your fan’s blades to run clockwise, a ceiling fan can be just as useful in the colder months as it is in the summertime. Reap the benefits of installing a ceiling fan in your home or office. Choose Sarasota’s premier lighting showroom with the largest selection of ceiling fans in the region today. Choosing a lighting showroom in the Sarasota area can seem like a tough decision, especially when there are so many options to choose from regarding lighting solutions for your home. Sure, you could shop online through major corporate entities, but shopping local at the region’s largest showroom has benefits that a corporate entity simply cannot provide. Learn further details about our lighting company below. Franklin Lighting has been the Sarasota community’s go-to, reliable source of lighting products and ceiling fans for decades. Our family-owned business was founded in 1968 and has seen three generations of the Franklin family. We’re proud to say our lighting products and accessories have been featured in upscale model homes that were created by the region’s top builders and designers. We only offer high-quality products to the community, and that’s been our mission since day one. Throughout the decades, we’ve expanded our lighting showroom to provide thousands of beautiful lighting products that come in a variety of styles, materials and sizes. We’re the region’s largest ceiling fan showroom with more than 140 fans on display, and you can find even more on our online catalog. Our experts know when you shop for a ceiling fan that will be in your home for years to come, you want to have a large selection of options to choose from. When you shop at Franklin Lighting, you can rest assured knowing you aren’t limiting yourself. At Franklin Lighting, we have a highly experienced staff who undergo extensive training before helping customers on the floor. We can help you make the most difficult lighting and design choices for your home or office spaces while providing you with an unrivaled customer experience. We stay on top of modern and recent trends, but we also keep in mind the lighting trends that are timeless. Whatever questions or concerns you may have, we’re here to help you quickly and efficiently to ensure you receive the care you need for any of your lighting needs. There’s a reason Franklin Lighting has consistently earned the Sarasota Herald Tribune’s “Best Lighting Store” Reader’s Choice Award since 1994 — we genuinely care about our community and our customers. Our staff is dedicated to providing customers with a shopping experience they won’t find anywhere else, which is something only a locally-owned-and-operated business can provide you with. At Franklin Lighting, we’re proud to offer the largest selection of ceiling fans to individuals in the Sarasota community. We are the area’s largest lighting showroom, and we only offer lighting products we trust from the best manufacturers nationwide. We also have the most knowledgeable experts on staff to help you find ideal lighting solutions for your home or office. Improve the rooms and spaces in your home with practical ceiling fans and optimized lighting. Need help? Our lighting consultants can do just that. Visit our Sarasota lighting showroom today and we’ll be more than happy to assist you with your next home improvement project. For more information, call us at (941) 585-0043 or fill out our online form.